If you follow any big online personalities that are typically positioned to be entertainers for a teen or young adult crowd, you might have seen a trend that many of them often take advantage of to help grow their audiences. They're called follow sprees, and when a really huge influencer announces one is going to take place online, there's no telling how much social engagement and viral reach they'll achieve from it. It's just what it sounds like. A user will quite literally follow hundreds (or possibly even thousands) of users on Twitter, Instagram, Vine or some other social network. Facebook is usually left out of the picture because it's not as open as many of the other popular social networks out there. It sounds pretty basic, but the most influential online celebs have a trick that harnesses the power of their adoring fans. They already know how big they are online and how much their followers love them, so in an effort to expand their reach and make their current fans happy, they typically bribe their followers to share their content with a promise to potentially follow them back if they do it. Given the fact that the users who announce follow sprees often have hundreds of thousands of fans, there's never any guarantee that if a user participates, they'll definitely get followed back. The most loyal fans can only keep trying every time a follow spree is announced and hope it will happen some day. Follow sprees come in all sorts of different variations, but it basically consists of announcing, "If you do X, I will follow Y of you back," where X could be a retweet, a revine, use of a hashtag or anything else -- and Y could be a specific number or a hint at a number that's completely unclear. Some celebs announce it hours or days ahead of time to create anticipation and prepare their fans for it. Here's an example of a real tweet from Vine star Nash Grier letting his followers know that he'd be doing a follow spree. In the tweet, he specifically states that followers must retweet his last three tweets, but leaves the other half of it vague and open-ended, saying he'd "follow a bunch" of users back if they did what he instructed them to do. And would you look at that! Over 33K retweets in just over two hours since he tweeted. Not bad, huh? 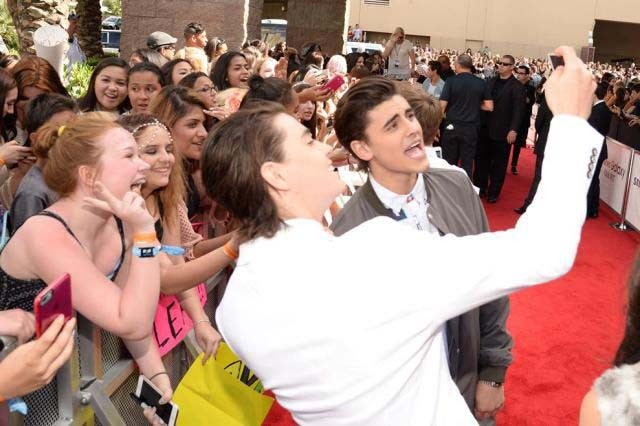 According to a survey conducted by Variety, teens are more starstruck by YouTube and Vine celebrities than they are with mainstream Hollywood celebrities. Regular people turned vlogging pros like Jenna Marbles, Tyler Oakley, Nash Grier, Jerome Jarre and so many more have put out enormous amounts of great content, perfected their personalities and nurtured their followers enough to be among the most beloved and successful Internet darlings in the entire world. Teens and young adults, driven by the hormone-induced emotional states that propel them to latch onto people they really look up to and admire, will often do literally anything to simply be acknowledged by someone like Nash, or any other online star. It's exactly why follow sprees work exclusively for this type of audience only. With a small audience or an audience that isn't very engaged, follow sprees wouldn't work very well (or even at all). Despite being such a wildly powerful viral marketing tactic, you'll never see brands or businesses using them, and that's because social media users don't admire or relate to them them the same way as they do with the personalities of these Internet celebs. In reality, the celebs who get to take advantage of their thousands of emotional and impulsive fans through follow sprees are totally normal, average kids who are just playing the popularity game in a more extreme case similar to what you see in high school. In the eyes of pubescent teenage users, however, each celeb's carefully crafted videos, photos, tweets, and status updates are enough to make them seem virtually perfect. Huge bonus points if they're vaguely attractive too. But as each celeb and their audience is destined to grow up, so too will they eventually grow out of the follow spree trend. If you're currently an 18 year-old average kid who happens to get thousands of retweets or reshares in a mere matter of minutes, though, it would probably be pretty hard to even think about ever wanting to give that amount of success and admiration up.